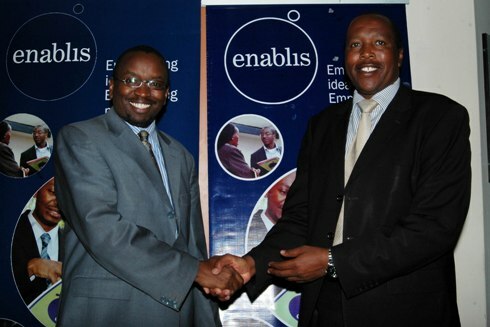 Enablis Entrepreneurial Network East Africa today announced the first loan disbursement of KES 20 Million to a Kenyan entrepreneur through its Loan Guarantee Program with Chase Bank. Enablis, a public-private partnership, operates at the grass-roots level and is dedicated to delivering to its member entrepreneurs key business enablers like capacity building support, business management training, mentorship, networking opportunities, and access to finance. Enablis loan funding partners in East Africa include Chase Bank in Kenya and National Microfinance Bank PLC (NMB) in Tanzania. Enablis member Athanas Matheka, the entrepreneur recipient of this KES 20 Million loan, is the owner of Greenforest Foods Ltd (GFL). GFL deals in refining, bottling and marketing of high quality pure natural honey. Greenforest Honey is a leading brand sold through all the major supermarket chains. Moses Mwaura, Regional director Enablis East Africa (Left) congratulates Mr. Athanas Matheka.